All of the Terminator sequels that have come after the ground-breaking second movie can pretty much be discarded or – perhaps more appropriately – crushed by the same hydraulic press that sealed the fate of the very first T-800 sent back in time. For instance, can you even remember anything about Terminator 3, or even Terminator Salvation (excluding Christian Bale’s now-legendary outburst on-set)? Yeah, neither can we. It’s likely that Terminator Genisys will be just as forgotten about as those other movies in a few years’ time, and for good enough reason – however, we’d actually argue that out of all the sequels to James Cameron’s classic 80s sci-fi action flick, Genisys is the one that has the distinction of not being entirely dull to watch. Granted, it is certainly a mess of a movie – several ideas are introduced but not fully explored, the tone is uneven, some of the action scenes become repetitive after a while, and there are even some instances of grave mis-casting that hurt the film more than it thinks it is helping – but like The Amazing Spider-Man 2, it is a mess that is still entertaining to look at and never leaves you completely bored. There is a bit more fun to be found in this than any of the previous two sequels, and while it doesn’t amount to something necessarily great or even that good you can still come out of it not feeling like you’ve wasted your time with it. We can, however, understand why others won’t like it at all, given that it gets itself muddled in its own convoluted storytelling. Starting out with what is basically a shot-for-shot remake of the opening few scenes of the first film, and kudos to director Alan Taylor for eyeing a pretty decent doppelganger to Cameron’s original vision (though it means we have to sit through some awkward CGI recreating 80s-era Arnie), the original timeline is soon interrupted by an alternate one with an older T-800 (Arnold Schwarzenegger, once again reprising his career-making role) suddenly showing up and duking it out with his younger CG counterpart. It turns out that old Arnie is now the “Guardian” (as is noted in the credits) of Sarah Connor (Emilia Clarke), the woman who was originally targeted for termination before conceiving her son John (Jason Clarke in adult form), a revolutionary in the future war against the machines. This comes to the great shock of Kyle Reese (Jai Courtney) who, as in the original film, had also returned to the past to protect Sarah from harm only to find she is more than capable on her own. Basically taking the idea of alternate timelines from J.J. Abrams’ Star Trek reboot and applying it to the Terminator universe, Genisys sacrifices series continuity and aims to run with its own ideas, but gets a lot of things muddled when it comes to establishing them. For instance, how Sarah and “Pops” – her robotic protector’s given name – have managed to build their own time machine that takes them forward instead of the usual backwards is anybody’s guess (one of the many things that’s either never fully explained or shoved aside for sequels), as is how a T-800 with real human tissue can simply grow it back after it’s been dissolved by acidic substances. A lot of it doesn’t make much sense, and trust us: that’s not even touching some of the more ridiculous plot holes this movie introduces. Much of the film does also play out as some sort of checklist of the other Terminator clichés, such as glimpses of the apocalyptic future as run by the machines, time travel, utterings of certain famous lines, the Terminator acting as some sort of protective guardian, and so on. It’s certainly easy to see why some would call this movie a dour rehash of the previous four films, especially when they don’t do much that can be considered new with any of it. It does, however, offer some cool ideas, such as “Pops” actually starting to experience malfunctions as signs of aging, but they are never fully explored and offered as a mere after-thought in the midst of the other nonsense going on around it. Schwarzenegger is clearly having a lot of fun reprising his signature role after a lengthy absence from the series (his likeness was briefly used as a CG creation in Terminator Salvation, while the real Arnie was on “Governator” duties), but oddly he seems like the only one who actually belongs in this particular universe. Emilia Clarke is fine as Sarah Connor, though despite the faint likeness she’s no Linda Hamilton, but the biggest mis-casting by far is Jai Courtney as Kyle Reese. It’s as if they didn’t even attempt to copy Michael Biehn’s likeness from the original and just randomly cast him in the role instead of a much more charismatic and – yes – younger actor; in fact, Anton Yelchin in Terminator Salvation was a better fit, so why not cast him again in that role here? But for Yelchin’s sake, it’s probably for the best because there are times when Reese can be written as kind of a whiner, almost to Anakin Skywalker levels, about the T-800’s presence and how he’s now on their side, something which rings completely false when one thinks of Kyle Reese as a character. Jason Clarke is entertaining in his role (even though the trailers really have dropped the ball when it comes to its supposed surprises that are now ruined) as is JK Simmons whenever he shows up, while Doctor Who fans may be disappointed to know that Matt Smith (amusingly credited as “Matthew Smith” in the opening credits) shows up for no further than five minutes, presumably to set up even more sequels. But although there are certainly multiple things against it as a continuation/reboot of the franchise, you have to give it credit that it does at the very least keep your attention throughout. Sure, it may be a dumb retread with a lot of things that don’t add up, but oddly enough you remember much more about it coming out of the auditorium than you honestly can with the past two sequels. That might be Terminator Genisys’ secret weapon: no matter how crazy things get, it can still leave you entertained. It’s a train-wreck, but it’s a fascinating train-wreck. 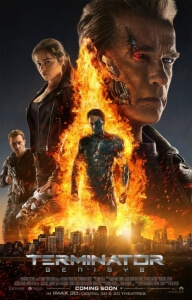 Terminator Genisys is definitely a mess of a movie, with several plot holes and retreads of the series continuity, and the grave mis-casting of Jai Courtney as Kyle Reese, but you never feel completely bored by it since it is so entertaining to watch despite itself. It’s definitely another inferior Terminator sequel, but it’s a much more enjoyable inferior sequel.